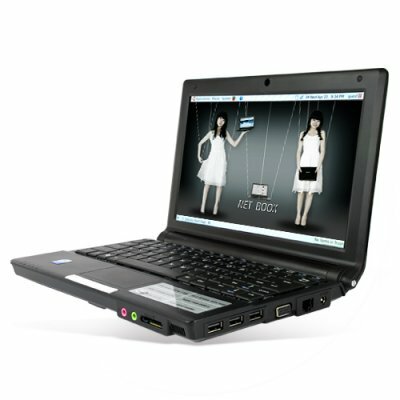 Successfully Added Linux Netbook with 10.2 Inch Screen + Bonus External DVD-R Drive to your Shopping Cart. Linux Netbook with 10.2 Inch Screen + Bonus External DVD-R Drive. The CVGD-PC05 is a new netbook style computer with Ubuntu Linux pre-installed. Providing both maximum portability and high performance speed, netbook computers meet the increasing need for mobility in the digital age. This Linux Super Netbook provides the everyday convenience of a netbook without sacrificing the performance you would expect from a full-sized notebook computer. As such, it is ideal for those who require a slim and lightweight ultraportable computer with the feature set of a standard laptop computer. The Linux Super Netbook is perfect for students, people who frequently travel, and any person needing a full featured computer to connect to the internet for email, to do work projects, or checking up on their stock portfolio. In fact, it is fantastic for just about anyone who needs a new laptop computer but would also like the enhanced portability available from the netbooks smaller physical size and lighter weight. This new netbook offers something you cannot find in most computers these days - it is preinstalled with Ubuntu Linux 9.04! Yes, you read that correctly, we took all our customer comments (that means you!) on what kind of mobile computer they wanted and this is what we came up with - our model PC05. That means this Netbook offers a full selection of preloaded Linux office and internet software such as Openoffice and Firefox, all in an easy to use GUI environment. Using the internet or included bonus optical drive, you can install more open- source software to make this machine perform the way you want, without the headaches or limitations you get with commercial Windows bloatware. Combine the usefullness of the newest Linux distribution (Jaunty Jackalope) with the Netbooks high-end design and you have a portable computer capable of doing as much work as you can throw at it, all with the high speed and stability you can expect from a well designed Linux system. The machine itself has a vivid 10.2 inch WXGA LCD display, the Intel Atom (N270) running at 1.6Ghz, 1GB of DDR2 RAM, 160GB SATA hard drive, high speed wireless 802.11B/G connectivity and an integrated 1.3 MP webcam for video capture and online chats with colleagues, family and friends. All the specs you need to you keep you running at top speed while you browse 15 net pages and run three office software projects at the same time. Welcome to the cutting edge of portable computing! If you have never used a Linux computer before then you are in for a treat because you will find that surfing the net and getting simple work projects done will actually be easier than ever. And for the experienced users - now you do not have to buy a machine and cross your fingers that you can get everything working, because we have done all that for you! This machine works right out of the box. Order your personal sample now and then feel free to contact our customer support team if you wish to import larger quantities into your country. High quality and affordable mobile computing solution. New Jaunty Jackalope Linux distribution pre-installed. Light but powerful netbook (only 1.2 KG!). Included external drive is convenient for installing additional software not available over the internet as well as enjoying disc based media. For best audio results use headphones. Internal speaker is only for basic system sound effects only. Netbook battery is rated at 3 hours - the actual battery life depends on the type of usage. I am new to Linux, do you have any tips or suggestions for me? Yes we do. While Ubuntu does have a friendly Graphical User Interface (GUI) and you will find that the preloaded software will handle many of your computing needs, we suggest you buy one of these two books - (1) "The Official Ubuntu Book, 3rd Edition" or (2) "A Practical Guide to Ubuntu Linux" to help you get the most from your new computer. In addition, sources on the internet such as will help you learn more about the Ubuntu Linux distribution pre-installed on the model PC05. I came across a password problem with the preloaded Linux from you, what is the pass word in the system? Sorry for the problems. You can try "guest" as the in put key. USEFUL HANDY AND WEIGHTLESS COUPLED WITH SUFFICIENT SPEED,FIT FOR EFFICIENT USE OF BUSINESS MAN PROFESSIONALS FREQUENTLY ON MOVE.